Hauling two heavy satellites into orbit, Europe’s Ariane 5 rocket checked off its fourth successful flight of the year on Wednesday, the 80th success in a row for the workhorse launcher in a streak that has been going since 2002. 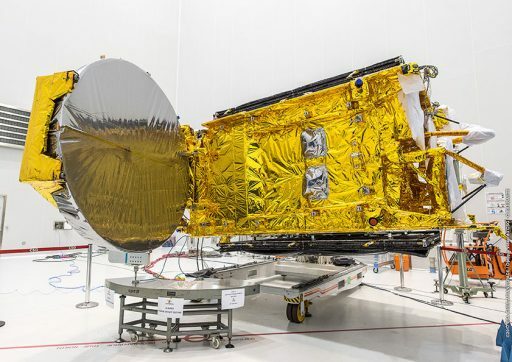 Hidden under the rocket’s large fairing were the shared Inmarsat-S/HellasSat-3 satellite for TV distribution and aeronautical connectivity and India’s GSAT-17 that will reinforce the country’s communications infrastructure. Making its third launch in eight weeks, the 55-meter tall Ariane 5 blasted off from the ELA-3 launch site at the Guiana Space Center at 21:15 UTC – rumbling off powered by its cryogenic core stage and twin boosters that did most of the work over the first two minutes of the rocket’s trip across the Atlantic Ocean, heading straight east to reach a nearly ideal Geostationary Transfer Orbit with an inclination of three degrees. 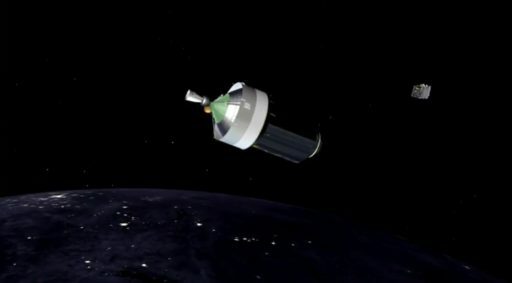 After the boosters dropped away 64 Kilometers in altitude, Ariane 5 relied on its core stage for another six and a half minutes before handing over to the ESC-A upper stage tasked with the final push into orbit via a 16-minute burn. 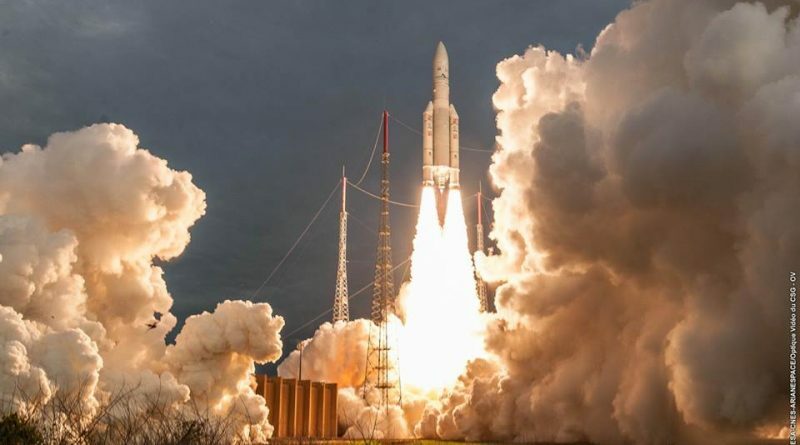 Having reached an injection speed of 9.3 Kilometers per second, Ariane 5 traded the power of its main engine for the precision of its orientation thrusters to send its two passengers on the way. First up was the Inmarsat-S/HellasSat-3 satellite that made its way into orbit atop the Sylda adapter that enables Ariane 5 to boost two sizeable spacecraft into orbit. Once the Sylda was dropped off, the way was clear for GSAT-17, the 21st Indian satellite lifted by Arianespace. 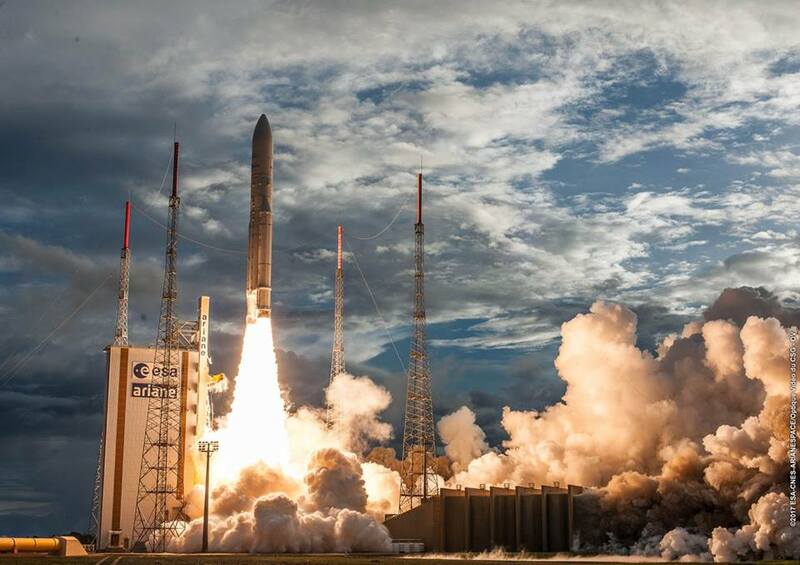 The two were the 600th and 601st satellites launched by the French-based launch services provider. 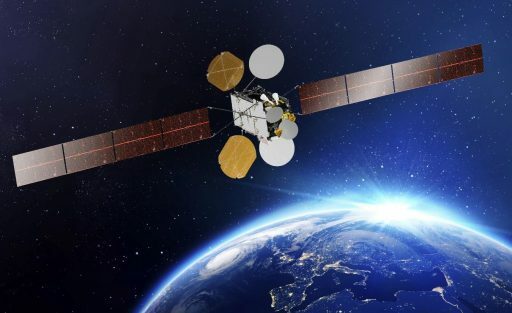 Inmarsat-S/HellasSat-3 is a shared satellite by London-based mobile communications provider Inmarsat and Greek operator HellasSat, born out of Inmarsat’s EuropaSat Project that stalled in 2009 and was revived five years later with plans for the condominium satellite. Per the agreement, the two project participants are splitting the cost for the satellite platform and its launch while each pays for their respective payload. Based on Thales Alenia’s Spacebus-4000C4 satellite platform, the craft stands 5.2 meters tall and weighs in at 5,780 Kilograms, featuring four large deployable antenna reflectors plus two parabolic antennas on the craft’s Earth-facing deck. The Inmarsat payload hosts a powerful S-Band terminal broadcasting in the 2GHz frequency band cleared for use through the European S-Band Application Process. Three large S-Band beams cover the entire European Union plus Norway and Switzerland, delivering in-flight connectivity to airline passengers as part of Inmarsat’s European Aviation Network that comprises Inmarsat-S as central space segment, a network of around 300 4G ground sites and airborne terminals on aircraft that automatically switch between capacity from ground stations and the satellite – creating a system that should provide users with high-quality, robust Internet services during their time aloft. The approach of a combined SATCOM and terrestrial system was chosen to meet high demand over heavily-trafficked air routes near Europe’s major cities and aeronautical hubs. In essence, the satellite is in charge of covering wide areas for cruising planes while the ground-based system delivers high capacity to localized areas of increased demand. The Hellas Sat segment of the satellite carries 47 Ku-Band and one Ka-Band transponders. The Ku-Band payload is primarily geared towards TV distribution with coverage over Europe to serve the company’s current user base that is presently served by a capacity from the 14-year old HellasSat-2 with 44 Ku-Band and one Ka-Band transponder. Two additional coverage zones over the Middle East and Southern Africa will allow the ArabSat subsidiary to tap into new markets with HD and Ultra-HD services. The multi-beam Ka-band payload is commissioned to provide capacity for broadband and business networks. 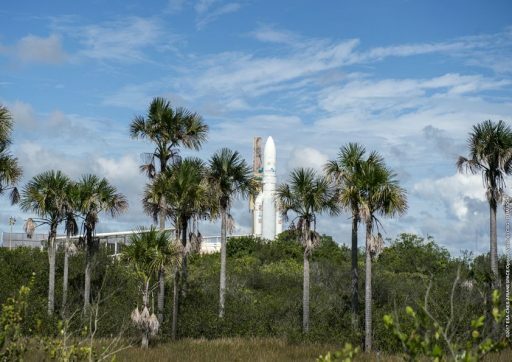 Destined for an orbital location of 39 degrees East, the condo satellite was initially planned to launch atop a SpaceX Falcon Heavy rocket in 2016, but persistent delays to the heavy-lifter’s debut mission prompted a switch to Ariane 5. Inmarsat lauded Arianespace’s ability to provide an extremely fast turnaround of seven months between the satellite’s addition to Ariane’s manifest and launch. 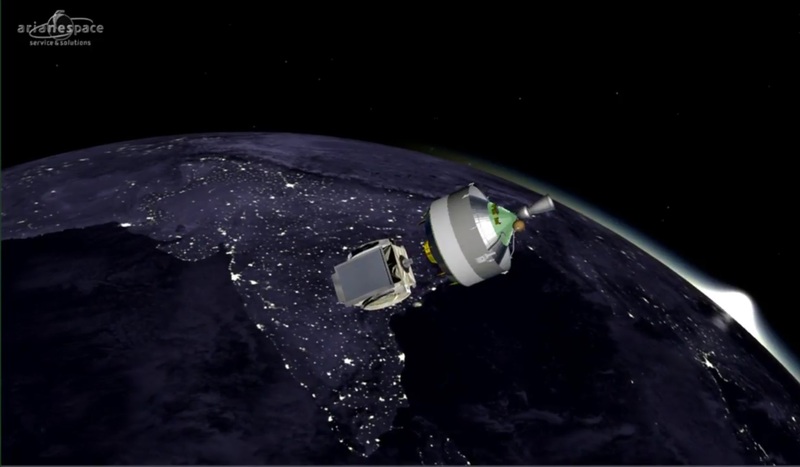 India’s GSAT-17 weighed in at 3,477 Kilograms and continued a long-standing partnership between the Indian Space Research Organization and Arianespace upon which ISRO relied for the majority of satellites that could not be launched from India. With recent successes by India’s GSLV rocket family, ISRO hopes to launch more and more satellites from Indian soil and eventually end its reliance on outside launch services providers altogether. 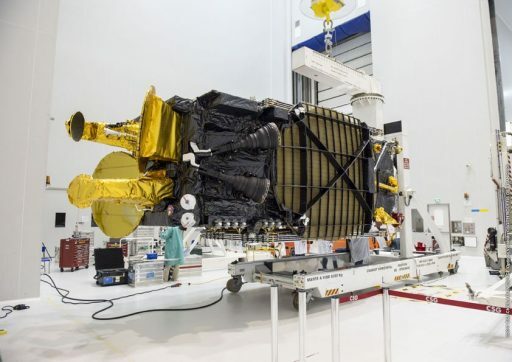 Designed for a 15-year service life, GSAT-17 is tipping the scales as India’s heaviest satellite to date, employing the I-3K satellite bus that is fitted with 38 C-Band transponders and two pairs of S/C and C/S up-down transponders for mobile connectivity. The satellite will ensure a continuation of operational services while also providing extension coverage to satisfy an ever growing demand for telecommunications services. Augmentation is provided for existing telecommunication, television and VSAT services. Also installed on the satellite is one dedicated transponder for Data Relay (DRT) and Search and Rescue (SAR) services. The launch of GSAT-17 capped a very busy month for ISRO that saw the successful first all-up launch of its GSLV Mk. III heavy-lift rocket with GSAT-19 and the launch of 31 satellites atop a Polar Satellite Launch Vehicle last week. The Ariane 5 VA238 launch campaign was characterized as very smooth following arrival of the launch vehicle components in mid-May and the two satellites by the end of last month. Operations continued running smoothly when the integrated Ariane 5 was moved to the ELA-3 launch complex on Tuesday for final preparations for an 11-hour and 43-minute countdown that picked up at 9:36 UTC on Wednesday. After power-up at L-10 hours, Ariane 5 went through detailed checkouts that provided a clean bill of health to the vehicle in order for the propellant loading process to be started. Tanking picked up on the first stage around 4 hours and 38 minutes prior to launch and 50 minutes later on the second stage to load Ariane 5 with 184 metric tons of supercold Liquid Oxygen and Liquid Hydrogen Propellant. Standing fully fueled, Ariane 5 underwent final preparatory steps for its fast-paced automatic countdown sequence while the two passengers made their transition to battery power for the ride into orbit. Ariane 5 entered the T-7-minute Synchronized Sequence after a brief delay due to ground systems readiness with computers taking over control to move the vehicle through a long list of steps to transition Ariane 5 to an autonomous launch configuration. The launcher finished topping up its tanks and entered pressurization, switched to internal power, and configured its Flight Control System for blastoff with handoff to the vehicle just seconds before liftoff. The trusted Vulcain 2 engine came to life when clocks reached zero, soaring to a launch thrust of nearly 100 metric ton force under close supervision by computers that ensured the engine was up and running before committing to flight via the ignition of the boosters at 21:15:07 UTC. Jumping off from its launch pad on the edge of the Amazon jungle, Ariane 5 had a thrust equivalent to ten Airbus A380s running at full power. Riding on pillars of fire and smoke, Ariane 5 pitched and rolled onto a due easterly departure path for a quick flight across the Atlantic Ocean, heading towards the sunset. The twin EAP boosters did most of the work in the initial flight phase, contributing the majority to Ariane’s total launch thrust of around 1,420 metric-ton-force – helping accelerate the launcher beyond the speed of sound just 49 seconds into the flight. Ariane 5 encountered Maximum Dynamic Pressure shortly after T+1-minute when passing 13 Kilometers in altitude. The two boosters, each consuming some 237 metric tons of propellant, finished their job at T+2 minutes and 19 seconds, helping accelerate Ariane 5 to over 2 Kilometers per second. Burnout of the boosters was sensed by their declining chamber pressure, triggering pyrotechnics to separate the boosters and separation motors to push them away from the still-firing core stage 65 Kilometers in altitude. Now only relying on its Vulcain engine, Ariane 5 continued towards orbit with a vacuum thrust of 136,600 Kilogram-force, tasked with accelerating the vehicle by another five Kilometers per second before handing over to the upper stage. 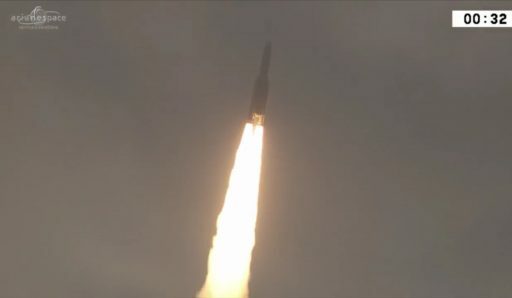 Passing 112 Kilometers in altitude at T+3 minutes and 16 seconds, Ariane 5 split open its Swiss-built payload fairing and separated the 17-meter long halves as aerodynamic forces were no longer a danger to the payloads. Separation of the fairing revealed the Inmarsat/Hellas Sat spacecraft while GSAT-17 remained hidden under the Sylda adapter for the duration of powered flight. The first stage exhausted its supply of cryogenics eight minutes and 52 seconds into the flight when it shut down its Vulcain 2 engine, having reached a sub-orbital speed of 6.95 Kilometers per second. Four seconds later – passing through 180 Kilometers in altitude – the 30.5-meter core stage dropped away and cleared the ESC-A upper stage to take over powered flight duties. The 6,400-Kilogram-force HM-7B engine of the second stage fired up just past T+9 minutes on a burn of 16 minutes and two seconds to provide another 2.4 Kilometers per second of delta-v to achieve the planned GTO injection speed of 9.33km/s. Initially focusing on building speed, Ariane 5 passed its minimum altitude of 156 Kilometers 15 minutes into the flight, from then on headed uphill to drop the satellites off in a highly elliptical orbit. Ariane 5 aimed for an optimized Geostationary Transfer Orbit of 250 by 35,786 Kilometers at an inclination of only 3 degrees – taking advantage of French Guiana’s low latitude plus surplus performance on the Ariane 5 to shave another few degrees off the inclination. Ariane 5 was carrying a total payload mass of 10,177 Kilograms on Wednesday, successfully accomplishing its planned orbital injection 25 minutes after lifting off when the vehicle had already reached Africa’s west coast. After a smooth climb, Ariane 5 traded the power of its main engine to the precision of its attitude control thrusters for the ballistic phase designed to carefully deploy the satellites on safe orbital paths. 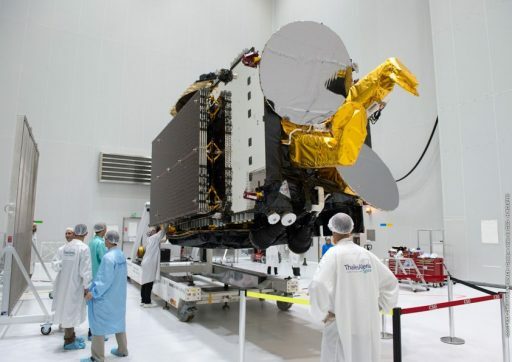 Springs pushed the heavy Inmarsat-S/HellasSat-3 on its way 28 minutes after launch, embarking on ten days of orbit raising and several weeks of commissioning, handled by Thales Alenia Space before the two operators can begin offering services through the spacecraft. ESC-A moved into a different attitude for the jettisoning of the Sylda Adapter at T+30 minutes to reveal the GSAT-17 satellite for its separation, coming after another nine minutes of coasting. GSAT-17 will complete several firings of its Liquid Apogee motor to take up station at 93.5° East from where it can cover the Indian subcontinent. For Ariane 5, the mission ended with the usual twenty-minute passivation sequence that included spinning the stage up, venting down all tanks and powering off onboard systems. Wednesday’s launch marked the 238th flight of an Ariane rocket in a program dating back to 1979, it was the 94th for an Ariane 5 and the 63rd in the ECA configuration. 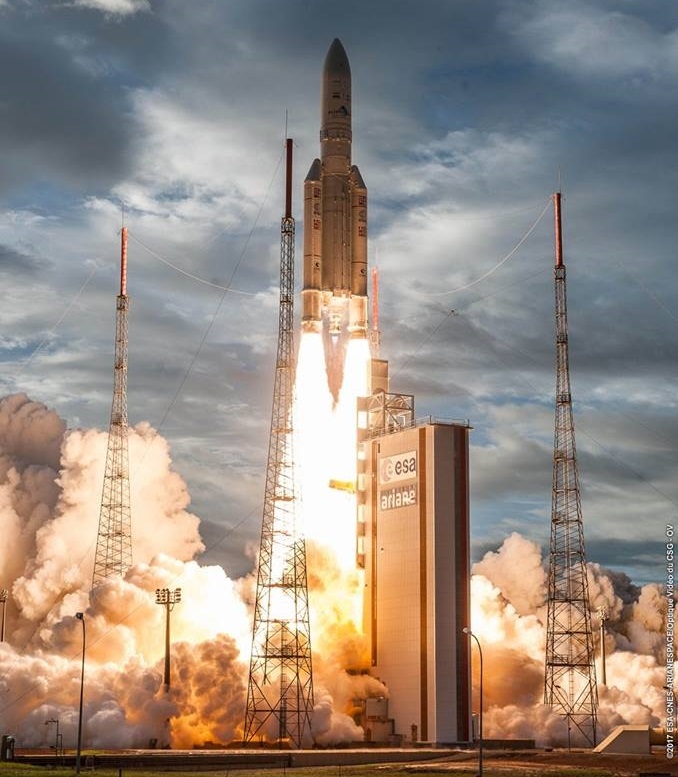 For Arianespace, the next mission is coming up on August 2 when a Vega rocket will lift a French-Israeli environmental monitoring satellite and a high-resolution imaging satellite for the Italian Defence Ministry. 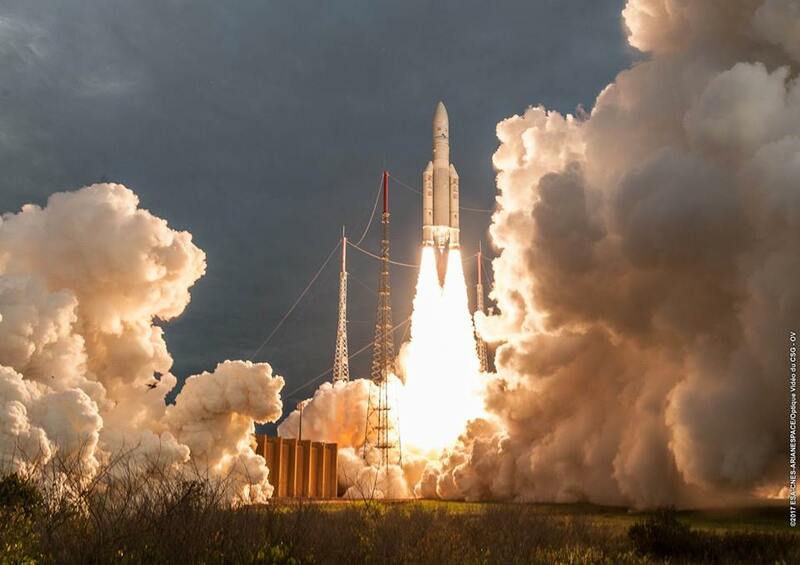 Ariane 5 will next see action in late August when lifting the Intelsat 37e and BSat-4 communications satellites.